Leah Kruse runs Indians' defense from the cage. There are many times during the season when Leah Kruse is the loneliest person on the field. They happen when her Skowhegan Area High School teammates are assaulting the opposing goalie with shot after shot. The 5-foot-4, 110-pound Kruse is at her acrobatic best when she’s challenging shooters and making diving saves, but she’s also learned to appreciate the game from afar. The key, the senior tri-captain says, is being ready when the tables turn, and that can happen quickly in a field hockey tournament played on turf. That wasn’t a concern for Kruse (pronounced Kru-zee) during Tuesday night’s Class A North regional final against unbeaten Messalonskee. The Eagles peppered her with shots, 23 in all, and she stopped 22 as the Indians upset the Eagles 2-1 to advance to Saturday’s state championship game for the 15th time in a row. A greater prize would be winning Saturday’s state championship against South champ Thornton Academy. Kruse was in goal as a sophomore when the Indians won a state title and last year when they lost in the final second to Scarborough. “When I think about it, I think how this will be my last game with (the team).” she said. Big deal, some say, Skowhegan always reaches the state field hockey final, and more often than not, it wins. But the Indians weren’t the favorite this season, nor were they last. Messalonskee’s been the team to beat and had defeated Skowhegan four straight times over the past two seasons entering Tuesday’s final. Kruse is the most vocal of the team’s captains and had one final word for the team in a practice before the game: confidence. Despite out-shooting the Indians 23-4, the Eagles only put one shot past Kruse. After losing to the the Eagles 3-0 and 3-1 during the regular season, Doughty concentrated on a defensive strategy rather than trying the run up and down the field with the Eagles and create scoring gaps. Kruse was the linchpin in that game plan. 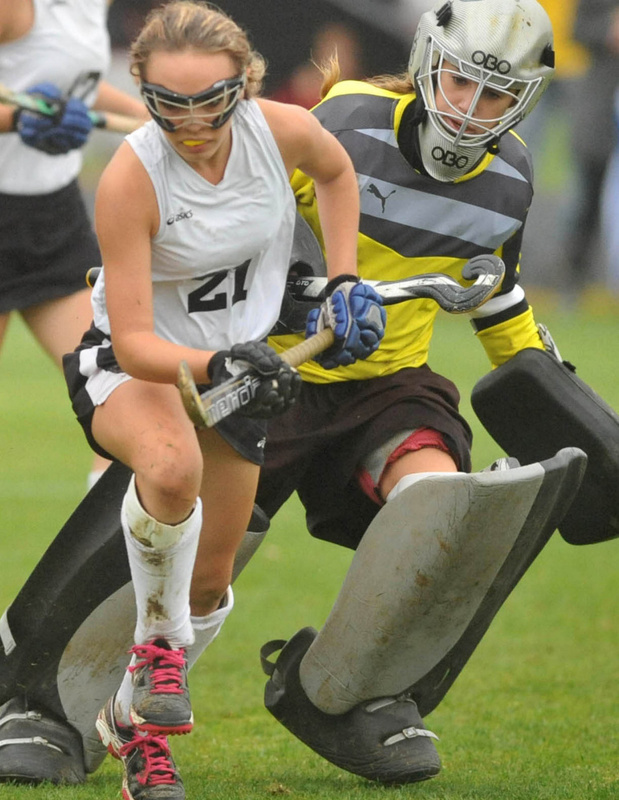 Kruse had not played field hockey when she tried out for the team in the sixth grade, and friends saw that as a chance to draft a goalie when the coach asked for volunteers. “Everyone was like ‘Leah can do it, she’s never played field hockey before,'” Kruse said. Kruse took the job to heart and became another in a long line of outstanding goalies for Doughty and the Indians, several who went on to play Division I in college. Some, Meagan Gove, for instance, had a style similar to Kruse’s where they dove to make saves and came far out of their cage to challenge shooters. Partially because of her size, Kruse decided long ago she’d be better off relying on her athleticism. As many of her predecessors have, Kruse has been recruited to play in college. She visited some Division I schools before settling on Division II Bentley University.